Thanks to an anonymous commenter for pointing out that a whole load of info about the future of the North London Line has turned up on the Office of Rail Regulation website. That's a train every 7.5 minutes east of Camden Road. There are no trains via Primrose Hill to Queen's Park, as was once planned. The 2 tph West London Line shuttle will continue, giving a train every 15 minutes between Clapham Junction and Willesden Junction. The Gospel Oak to Barking line stays self contained, with a 4 tph service, apparently due to the high cost of through platforms at Gospel Oak. The connections at Gospel Oak in the draft timetable don't look good. No upgrade to the Euston-Watford service is included yet. There'll also be 8 trains per hour beyond Dalston Junction to Highbury & Islington. 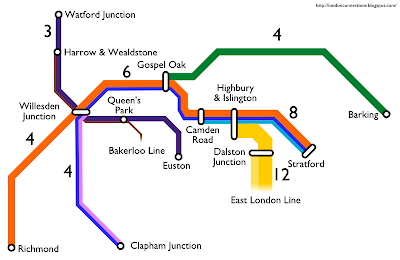 The diagram in the application form names them as the Crystal Palace and New Cross services, meaning the third service - from West Croydon - will only go as far as Dalston Junction. There's a detailed diagram of the new track layout between Camden Road and Dalston, which confirms the plans for the East London Line to have a segregated route to Highbury & Islington, with little possibility of ELL trains continuing beyond there (forget about circular services). Highbury & Islington will end up with 3 eastbound platforms, each on a separate island. Another document gives details of how stations will be refurbished, with improved CCTV, lighting, help points and PA systems. Stairs, flooring, walls, canopies and platform services will brought up to higher standards. LED next train indicators will be installed. Construction work to rebuild the North London Line track begins this September, with the new timetable due in December 2010. I spent some time poring through those documents today - some right interesting stuff as well as enough legalese to make me lose the will to live. Eugh. Anyhoo, it appears to me that the Stratford-QP (or even Willesden Jn LL) service will only be introduced once the Bakerloo is extended to Watford Junction, and the track access agreement sought by TfL explicitly does NOT cover the Watford DC services. I expect that we can look forward to another fifteen or so documents when these proposals finally see the light of day! Do we know the timings for the temporary Willesden-Queen's Park-Camden Road service? The route seems more direct, and has less stops than the Hampstead route, so if it was signalled (and doubled) adequately it would be faster for people travelling from WJ to Camden Road and points east. This might then lead to a call for this service to be retained. THC: I'd be careful of your use of when. I think the Bakerloo Watford extension is no longer a short term possibility. I'd link it to the replacement of signalling and rolling stock due in 2019 and the semi-confirmed spectre of a southern extension. Abigail: A quick check of Google Maps says it's 4.7 miles vs 5.7 miles. No timings yet, but I doubt it's significantly quicker. And what needs doubling? There's no direct route from Richmond to Queen's Park. You'd have to reverse twice, calling at both bits of Willesden Junction. Seeing as Primrose Hill is all but dead (or at least comatose), what is the point of not through-routing the 2tph WLL Shuttle and the 2tph Stratford-Camden service? Capacity at the various flat junctions along the way, plus it would require extra trains in service. "LOROL has said that start and end times are crucial and access in to Willesden TMD may be problematic and there is a very short window of maintenance opportunity. A compromise may be needed with reduced service outside of peak hours." Response: "TfL has agreed to thin out early morning and late night services in order to resolve the issue." From the original post: "Construction work to rebuild the North London Line track begins this September, with the new timetable due in December 2010." "Adjustments to the NLRIP work programme. A provision has been included to record: (a) the parties view that there is currently insufficient knowledge to determine whether the NLR Infrastructure Works will be completed by the Principal Change Date in December 2010 (Clause 6.4.1)"
Study of the 'legalese' sections of such applications is always more revealing than the accompanying PR releases. Rolling Stock - Appendix 7. Are thes figures for capacity of the existing stock, 500 per car, and the new, 667 per car, realistic? Are they mathetically challenged? All those percentage increases are a bit iffy; 6000 - 10,672 was a rise of 78% when I was at school. Oh dear. And I'd contend that is exactly where the railway has gone wrong in the chosen structure for privatisation, anonymous. Plans like this should be driven by vision and strategy and not by the legal detail. We really shouldn't have to trawl to the bottom of appendix 7 to find the essence of what's going on. or at http://www.railpro.co.uk/issues/pdfs/apr_whole_issue.pdf. (4MB file). Thank you for publishing this useful blog. I edit a small website read by a few hundred people living near Gospel Oak. They would be interested in the proposed service frequency explained in "The North London Line upgrade". May I reproduce your diagram overground.png on my website hle.org.uk? I once was offered help down the stairs at Camden Road by a lady struggling with a push chair with one child and another recalcitrant toddler. I said I was old (60 +) but tough although it was a struggle with a heavy case and a smaller piece. What about disabled people? It is a disgrace that London Transport, the so-called TFL, seems to have no plans for easy access on this line. One doubts the competence of such highly paid staff as run it. This was confirmed to in my view by my daughter's experience trying to leave the recent Madonna concert at Wembley: a complete mess, as she and friends were directed by the police to an underground station which was closed by the time they got there. I always find the bus service after Prom concerts quite inadequate. Could TfL run a vicarage garden party? I doubt it.